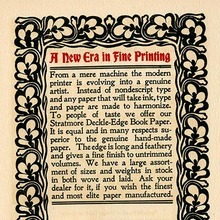 Released in 1893 for the Dickinson branch of ATF. This is Joseph Warren Phinney’s unauthorized take on William Morris’ 1890s Golden Type, a chunky interpretation of Nicholas Jenson’s Renaissance types. [HiH] Sold by Stephenson Blake as Italian Old Style , (not to be confused with other types of the same name). Digital versions are limited to HiH’s Phinney Jenson, a Bold Condensed drawn by Brignall and Sack for Letraset and now published by Linotype, and a digitization of Hamilton’s wood type. ITC Golden Type is a more complete revival of the original Morris type and is used for this sample.